State attorneys general have long served on the front lines of the struggle to control and discipline predatory for-profit colleges that saddle students with crippling debt while granting them useless degrees, or no degrees at all. On April 9, nine of them who know firsthand how people can be deceived and bled dry sent a letter to the Department of Education, asking it to provide restitution — and help fix the problem — by forgiving the federal student loans of people harmed by crooked schools. The letter makes a strong case for prompt action. The idea of forgiving these loans altogether gained traction when a group of former Corinthian students refused to repay their loans, which they claimed were often the product of a predatory private lending scheme. The group, part of an organization called the Debt Collective, noted that the Department of Education had broad authority to forgive debt in cases where schools had committed wrongdoing. The department could then force the offending schools to reimburse the government. The attorneys general promised to help the federal government recoup loan balances from schools that violated state laws or benefited from unlawful deception. Over the last 20 years, the Department of Education has received only a handful of requests from borrowers seeking to escape repayment on grounds of wrongdoing by schools. Evaluating many such requests will be difficult. But the evidence shows that such a system is needed and that relief is long overdue. A recently released study found that "being represented by a union pays big financial dividends for full-time instructors at community colleges." Depending on the size, location, and public-financing sources of their institution, unionized full-time instructors earn from about 5 to 50 percent more in pay and benefits than do their nonunionized peers at similar community colleges, says a paper summarizing the study’s results. "The differences are stunning," says Stephen G. Katsinas, a professor of higher education at the University of Alabama at Tuscaloosa who is one of the study’s three co-authors. Among the forces influencing how much community colleges pay their instructors, "collective bargaining, in itself, matters," says Mr. Katsinas, who plans to present the study’s findings in New York on Sunday, at an annual conference held by the National Center for the Study of Collective Bargaining in Higher Education and the Professions. Other research on the impact of collective bargaining on faculty pay has struggled to quantify how much differences in instructors’ earnings were attributable to unionization versus other contributing factors, such as differences in institutional size or in the regions that colleges served. Mr. Katsinas and other scholars reached conclusions similar to the new study’s in a 2006 analysis of community-college data, but that effort was hampered by a reliance on outdated data on where unions existed. It also failed to take into account 113 institutions — among them, large community-college districts such as Miami-Dade — that could not be factored into an analysis of community colleges under the classification scheme used by the Carnegie Foundation for the Advancement of Teaching. The new analysis uses a modified classification scheme to factor in the previously excluded institutions, which include community colleges that either offer four-year degrees or are offshoots of four-year public institutions, as well as public baccalaureate colleges that primarily offer associate degrees. It uses federal data on faculty earnings from the 2010-11 academic year, the last for which the Education Department collected information on benefits. "There are amazing differences in monetary compensation of full-time faculty across the landscape of community colleges when geography, collective bargaining, and local appropriations are all accounted for," the new study concludes. On average, it found, unionized full-time faculty members annually received pay and benefits amounting to about $95,000 at community colleges that received a significant share of their funds from local governments and about $77,000 at community colleges that lacked such a local source of financial support. Nonunionized faculty members received less than $68,000 in pay and benefits, on average, regardless of where their community college derived its tax revenue. The size of the community college where a faculty member worked and the type of community it served also made a big difference. At the top of the pile, full-time faculty members at suburban, multicampus, locally financed community colleges annually earned an average of nearly $106,000 in pay and benefits. At the bottom, such faculty members at small, rural, locally financed community colleges earned total compensations averaging just over $61,000. The other authors of the new study were Nathaniel J. Bray, an associate professor of higher-education administration at the University of Alabama, and Barry R. Mayhall, a doctoral student in higher education at Alabama and a mathematics instructor at Snead State Community College, in Boaz, Ala. The paper on their findings will be released after next week’s conference. Peter Schmidt writes about affirmative action, academic labor, and issues related to academic freedom. Contact him at peter.schmidt@chronicle.com. Dr Martin Luther King Jr. was assassinated today, April 4th, 1968 in Memphis Tennessee. Dr. King went to Memphis to support the right of public employees', Memphis' sanitation workers', right to engage in collective bargaining, the same right that Governor Walker and the Republican legislation eliminated in Wisconsin! Robert Kennedy, the U.S. Attorney General, was in Indianapolis about to give a speech in an inner city neighborhood when King's murder occurred. Here is his announcement. Bobby Kennedy was assassinated 68 days later. Labels: Bobby Kennedy, Dr. Martin Luther King Jr.
Dr. King: "I've been to the mountain top"
Forty-seven years ago today, Dr. Martin Luther King Jr. returned to Memphis to stand with sanitation workers striking for union recognition, the very same rights Governor Walker and the Wisconsin Republican legislature eliminated in 2010. That evening, April 3rd, Dr. King delivered his famous "I've Been to the Mountaintop" speech in a church packed with union members and their supporters. The following day he was murdered! Forty years ago the owners of Milwaukee’s meat packing plants launched a war on unions. Milwaukee’s working class is still suffering from losing that war. 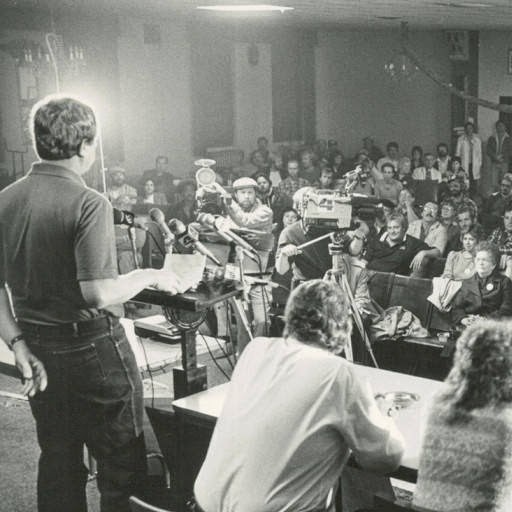 On January 25, 1975, over 700 members of Local 248, Meat and Allied Foodworkers Union, struck Milwaukee area meatpacking plants in response to a proposal that would cut their wages. For generations, Milwaukee boasted of a large, unionized, blue-collar middle class. It was a place to put down roots and raise a family. Neighborhood culture was often defined by industrial bowling leagues and neighborhood taverns owned by former factory workers seeking to be “their own boss” and escape assembly line drudgery. While highly segregated, economic inequality was at historic lows. Milwaukeeans enjoyed the nation’s second highest median household income in 1969. The black poverty rate was 22% lower than the U.S. average in 1970, and African American median family income was 19% higher than the U.S. African American median. As the 70’s began the Wall Street Journal dubbed the city the “Star of the Snowbelt.” In large part, this reflected the high rates of unionization among workers laboring in Milwaukee’s foundries, tanneries, meatpacking plants, and at manufacturing firms like A.O. Smith and Allis Chalmers. Skilled tradesmen and foundrymen, teachers, retail clerks, unskilled and semi-skilled workers were represented by unions at the bargaining table, on the job and in elections. Because of union wages and benefits, they could buy their own homes and maybe a cabin up north or a fishing boat. While neither management nor workers sought strikes, they were tolerated as a legitimate, although undesirable, part of contract negotiations. 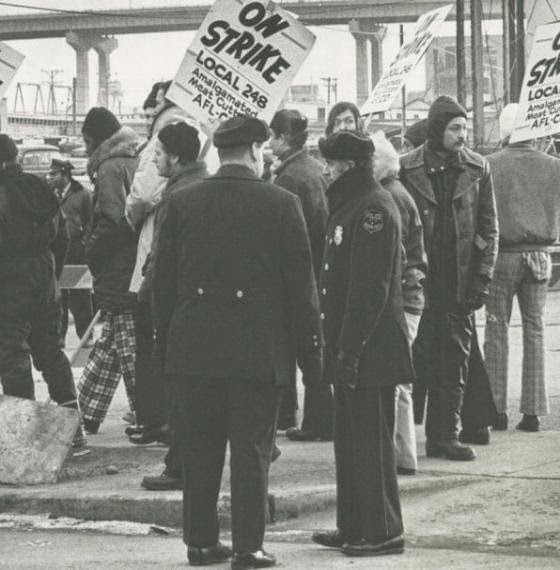 In the late 60s and early 70s, Milwaukee unions participated in a national strike wave as workers sought salary increases in response to war-induced inflation. In 1969 Schlitz workers and MATC’s faculty union struck. In 1973 workers from A.O. Smith, Briggs and Stratton and Harley Davidson, three of Milwaukee’s manufacturing elite, struck at the same time. These strikes were eventually resolved, new contracts signed, and none of these companies attempted to bust the unions. All of this changed in 1975 with the Meatcutters’ strike. The very day the strike began, the eight companies represented by the Milwaukee Independent Meatpackers Association began hiring replacement workers, some recruited from as far away as Nebraska and Texas. In response to this first attempt by Milwaukee employers to bust a union since World War II, the Menominee Valley filled with angry picketers, black, Latino and white, rallying to protect their jobs. After 15 months the employers association had their victory and decertified the union. Hundreds of hard-working union men lost their jobs. Full-time permanent employees were replaced by low-wage workers frequently hired through temp agencies. The strike legitimized replacement workers, beginning waves of attacks on unions and the city’s working class. When UAW workers struck Master Lock in 1979, Milwaukee police officers escorted replacement workers across the picket line. Two years later A.O. Smith built a non-union plant in Tennessee, the first nail in the coffin of its Milwaukee Automotive Works, which had dominated the city’s north side since the early 1920s. Briggs and Stratton experienced another strike in 1983 after its local unions refused demands for concessions in wages, benefits and work rules. Following the 13 week strike, the company asserting that it would never be held hostage again began to relocate work to the low-wage, non-union south. While many associate the war against labor with President Reagan’s firing of the nation’s striking air traffic controllers in 1981, it actually began much earlier. Powell urged “American business” to demand “equal time” on college campuses and the nation’s airwaves. His memorandum inspired the founding of conservative think tanks like the Heritage Foundation, Milwaukee’s Bradley Foundation, and the Cato Institute. Wealthy businessmen like the Koch Brothers poured tens of millions of dollars into right-wing initiatives. Milwaukee’s meatcutters had the misfortune of being Milwaukee’s first victims in this war to redistribute income. Subsequently, replacement workers were used at Master Lock and to break the union at Patrick Cudahy in 1987. After these bitter defeats Milwaukee area union membership plummeted, and so did real hourly wages. Bernie Peck, the owner of the largest meatpacker, Peck Meat Packing, bought up most of the smaller meatpacking companies during the strike. He eventually sold them to Emmber Foods and became a celebrated philanthropist. While the community enjoys the buildings named after him, Milwaukee’s working class paid such a very heavy price that many cannot afford to buy a home much less a cabin up north. The corporate class war against Milwaukee’s workers that began with Local 248’s defeat is one of the principle reasons Milwaukee has declined from a relatively prosperous, blue-collar, middle class town to one of the nation’s poorest cities. Since 1979 private sector union membership has plummeted while Milwaukee’s median household income has fallen by a staggering 25.4 percent. Milwaukee's African American poverty rate is now 49% higher than the African American national average, and median income is 30% lower. Local 248 was one of many industrial unions organized by the Greatest Generation that turned low-paying jobs into stable, middle class employment. Today, many of Milwaukee’s large unionized, manufacturing plants are gone, replaced by low-paying big box retail and service sector jobs. If Milwaukee is to enjoy a broadly shared renaissance, the current generation of underpaid workers will need to learn from history and create 21st century unions that turn low-paying employment into middle class jobs.